Ben Cove, Interloper, acrylic on panel, 50 x 62.5 cm, 2014. Courtesy the artist. Why did you decide to move from architecture to being a full-time artist? I did architecture because I was interested in it when I was at school, and I was led to believe that being an artist wasn’t really an option as a career. But I knew quite soon that I probably wasn’t going to be very fulfilled as an architect. I started to understand that most architectural projects are heavily compromised by all sorts of things. I did finish a BA in architecture but knew I wasn’t going to carry on with it. I thought when I left my architecture degree that I would leave all that behind me but I didn’t at all. Architecture has had a huge impact on me. The architecture course was a very modernist one, at the University of Nottingham. You were taught things like ‘form follows function’, and you were taught that ornament was something superfluous. It took me a long time (after I left architecture) to make work which wasn’t quite logical and quite rational. Who were the architects foregrounded in the course? Corbusier was a major emphasis. We were taught high modernism. We weren’t taught all things in modernism. I reacted against high modernism and I saw it as quite a narrow-minded doctrine. And so European modernism? North American modernism? A bit of American but very much early modernism. I am now interested in what people like Corbusier were doing post-war. Architecture has permeated all my practice. In the past I would have said that I’m interested in modernism because it’s a Utopian thing (which is questionable). I’ve started to look now at where things go off-kilter a bit. Things like Corbusier’s Cabanon – a hut that he built, which has a rationalist plywood interior but looks very primitivist on the outside. It’s these kinds of things that I’ve found much more interesting because they introduce things outside of European culture. When Corbusier did things like Chandigarh in India he used a lot of local approaches to building. I feel that this kind of approach is redemptive in some way of the doctrine of European high modernism. There are critiques of modernism from feminist and post-colonial perspectives that draw attention to European modernism’s complicity in historical, social and political conditions of violence and power. For example, colonialism. There is also the story of how Corbusier defaced Eileen Gray’s E.1027 with his murals to the interior and exterior of the house. Yes, there are photographs of him, naked, painting murals on the walls of E.1027. It’s an act of macho posturing. But having said all this he did, at the same time, build some amazing buildings. I went to Ronchamp last year. I stayed in the Unité d’Habitation a few years ago, which is amazing. I have made work which references modernism quite directly. I did a show at Cell Project Space just before my MA. I made a pantograph, which is a large drawing tool. It makes wobbly drawings. It has four arms, which are hinged. You basically have a pointer and a pencil, and you trace an image with the pointer, and the pencil moves in exactly the same way. So it copies the drawing and you can enlarge and reproduce it. They functioned as a way of reproducing things by architects and artists. There are 3D versions, which sculptors use to make maquettes. Pantographs were always used as a very precise thing. I remember having one as a kid and thinking I could reproduce a drawing very well. But I ended up with a very wobbly drawing. It mirrors your imperfections. I made a very big version of this drawing tool. I oversized it massively and then made drawings of the Bauhaus at Dessau. They came out very wobbly and distorted, and nothing like the kind of aesthetic that they’re supposed to be. I buy a lot of records and I used to buy a lot of spoken word records. I videoed the record player from above, and then I rotated the whole frame of the video at 33 1⁄3 rpm, the speed the record was playing. The record appears to stay still and everything else goes round. It was partly a way for thinking about how you present this material so that it retains its clarity. But also when I first got a video camera years ago I thought you can do this and see the record static and everything else going round. It was a curious way of thinking about how you can use technology to see something in a different way. 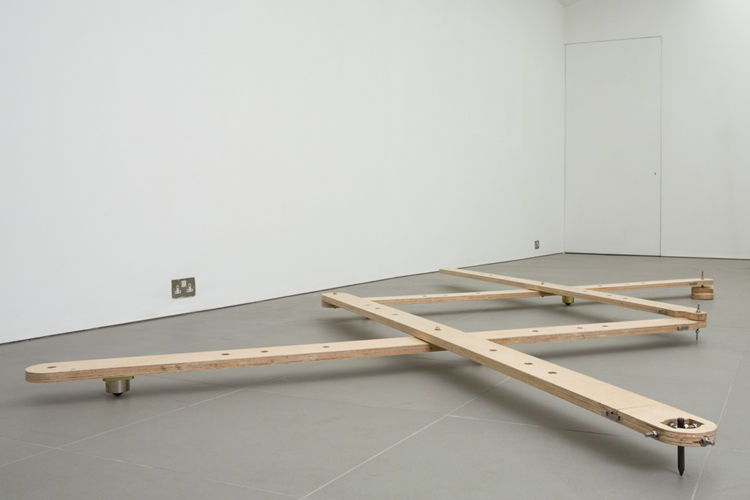 Ben Cove, ‘Pantograph’, plywood, graphite stick, ball casters, metal fittings, sizes vary (each arm 220 cm), 2006. Courtesy the artist. 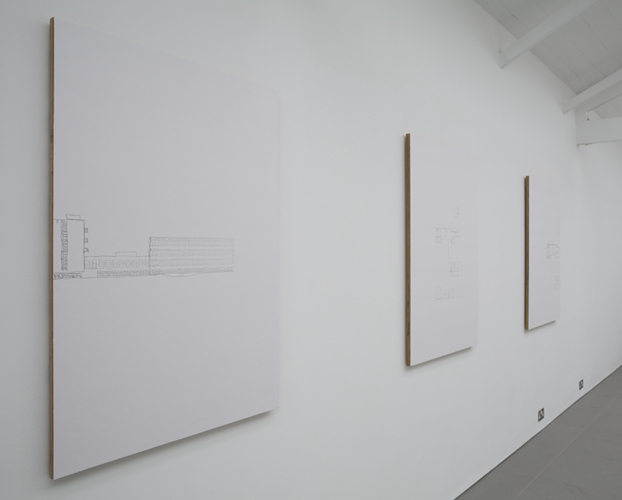 Ben Cove, Pantograph Drawings of the Bauhaus at Dessau, graphite on paper mounted on plywood, 59.4 x 84.1cm (A1) each, 2006.Courtesy the artist. 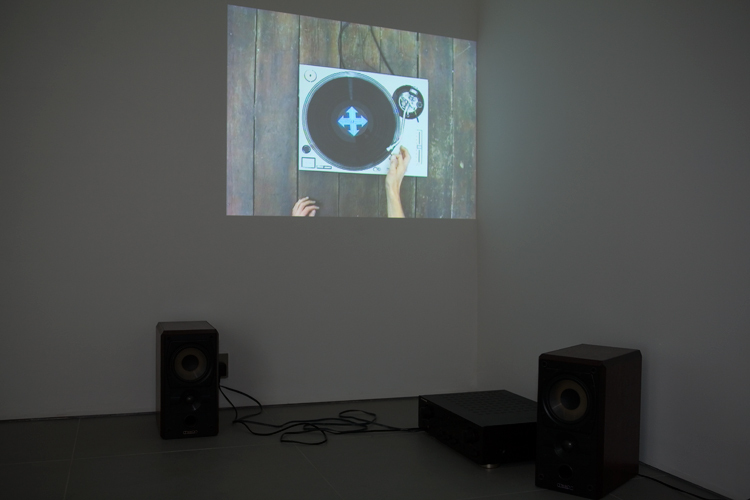 Ben Cove, Conversations Regarding the Future of Architecture 1956 (installation view), looped single channel video with sound, 2006. Courtesy the artist. How you work with ideas about modernism as an artist also speaks to the question of artists and their relationship to archives. I occasionally worry that I’m plundering all this history and I’m not making work that’s about current events and things that are going on now. But actually I feel like the way you re-present these things says a lot. There is an argument that we are still in a modernist period and not in a post-modernist period. I see historical time as much more fluid and malleable. Part of it, for me, is about a pure aesthetic. I like a lot of the material I reference. Much of the work I make now doesn’t reference modernism quite so clearly, and I have taken a lot of the appropriation out of the work. But I still use images and research around that time. Another example of your dialogue with architectural history is the work you made for an exhibition at Castlefield Gallery, Manchester, in 2004. The show was called ‘New Plastic Universal’. I made a Geodesic ball. I designed it and worked with a friend who is now an architect. Buckminster Fuller designed the Geodesic Dome, which is the most economical way of spanning any space. I decided I would make a self-contained gallery space with video and audio work. It was a space for one person and upholstered on the inside, with a reclining seat, and a TV and speakers. When I made it for the show it was supposed to be a prototype of something which could be mass-produced. It was a bit tongue-in-cheek. I’ve always looked a lot at architectural propositions, things that are never built. At that time I looked a lot at people like Archigram, the ‘60s British group who did crazy stuff that would never be built. They introduced the language of advertising into architectural drawing. They were very revolutionary. There were also people like Superstudio who were an Italian group of largely theoretical architects. I looked at all this stuff. I came up with this idea of a self-contained gallery space because the white cube is quite problematic for showing video. I made it and I thought: ‘What do I put inside it?’ It was supposed to be a prototype and it was the idea of the thing itself rather than what I put inside it. I ended up showing a loop from 2001: A Space Odyssey. 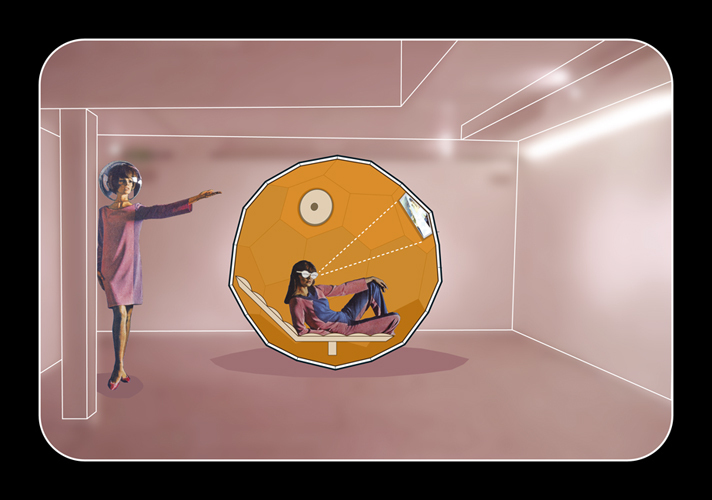 I showed a section of the film where the guy lands at the space station and it’s this futuristic interior but it also has sixties furniture in it. I didn’t want to put in a piece of work because then it would appear that the work was made for that space. You also made prints for the show at the Castlefield Gallery? I did digital mock-ups to some extent in the style of Archigram. Archigram would make these images where they cut people out of advertising and they would draw bits of buildings, for example. They used to design crazy machines not just buildings. Superstudio did the same thing. They had this very utopian language of architectural drawing, which is so different to what you saw previously. The show at Castlefield was very different to the work I made before it, and I haven’t done anything like it again. Ben Cove, Pod, powder coated aluminium, metal fittings, upholstery, lcd screen, speakers, A / V components, approx. 220cm diameter, 2004. Courtesy the artist. 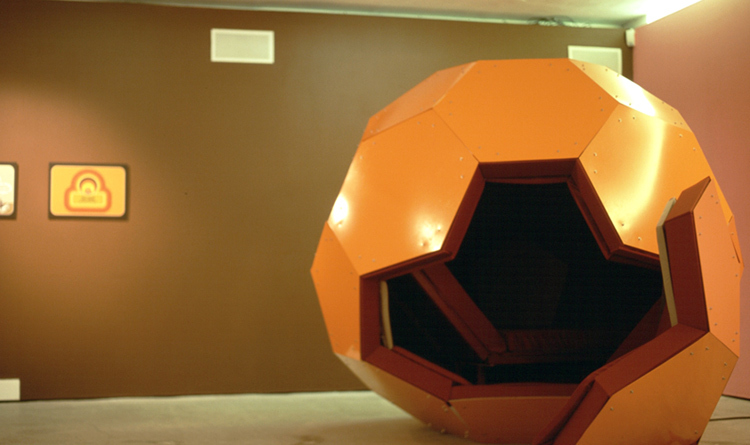 Ben Cove, Pod Mockup 2, mounted digital print, 50x30cm, 2004. Courtesy the Artist. How do you see your your relationship to painting? A lot of painters are fixated on painting as the superior language of making art, and I am not in that camp at all. I started out doing a lot of painting. Then, I completely stopped painting for 3 or 4 years before my MA. With the show at Cell Project Space my work had got more conceptual: I was coming up with an idea, developing an idea, and then making it. For my MA I wanted to throw this up in the air a bit, and have a practice which was more intuitive. This goes against the Goldsmith’s approach but because I had quite a clear set of reasons as to why I wanted to do that they were very supportive. Do you think that there an absolute distinction between rational/intuitive? When I hear people say: ‘I just make intuitive work’, it fills me with horror because I just think it’s a cop out of having any kind of reasoning. After making work for several years I started to understand that I don’t know what I am doing consciously (as I’m making the work). I don’t think that your conscious mind keeps up with your unconscious mind. What I wanted to do was to have a practice, which was led by less rational thinking because I thought this interesting (and I think the people that I like do that). I made painting and sculpture and painting for my MA show, one day paintings. 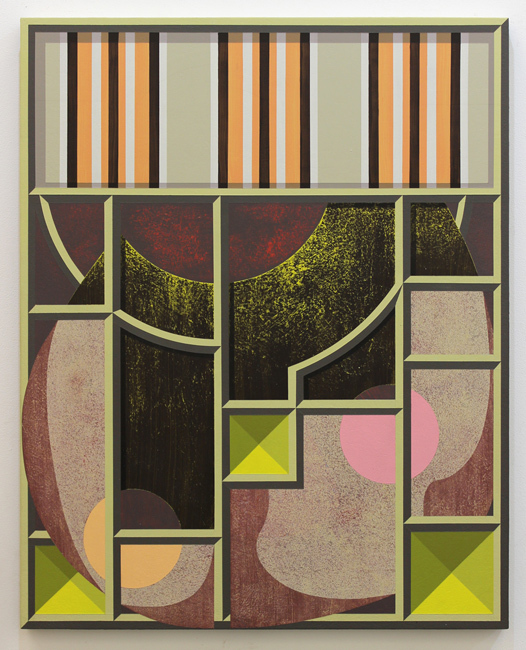 Ben Cove, Dissenter, acrylic on panel, 50 x 62.5 cm, 2015. Courtesy the artist. Let’s talk to your most recent paintings, which we are looking at in your studio. You can’t really tell whether they are paintings or objects, and so there is a sense of ambiguity. They also seem quite humorous to me, you work with strange shapes, and there seems to be a visual play on all the things that have preoccupied you, your relationship to architecture and modernism. I can see an interest in precision, clarity and geometry together with organic shapes. I also notice artificial shadows, and how these make me aware of your painting/objects as constructions of visual worlds and spaces that are also imaginative. There is ambiguity between what looks real but isn’t. Surfaces that appear three-dimensional are flat, and I am hyper-aware of this in your painting. What you think about is informed by what you have read, and is not necessarily about first-hand experience. What you read is surrounded by myth and personal narratives. All these things are constructions, and all art, and histories like modernism, is a construction of some sort. These paintings are slightly convincing as three-dimensional things but they are not intended to be trompe l’oeil. I am also thinking about architectural drawing, which is partly schematic diagram and partly pictorial. Architectural drawings have shadows, and images of buildings that you never ever see because nobody ever sees things flat-on as a façade. This language makes you think you understand a building or a form, and it is a way of presenting three-dimensional things in a flat way. This has always interested me because you are very aware that this is fake or artificial. When I did my MA dissertation I wrote about the changing depiction of the body and the figure within architectural drawing from early modernism up to now. Today you see a CGI (Computer Generated Image) of a new building and it has photomontage cut-and-paste pictures, and it’s all very homogenous, advertising really. The point is to sell you something. Figures in architectural drawings were put in usually to give a sense of scale but then they started to be used to sell an idea. There’s a pencil drawing by Erno Goldfinger, an interior of one of his tower blocks, which has an image of a woman and a baby playing in this light, like a Mother and Child image. It’s selling you this idea of purity and innocence. I always think that my work relates to the body in some ways. 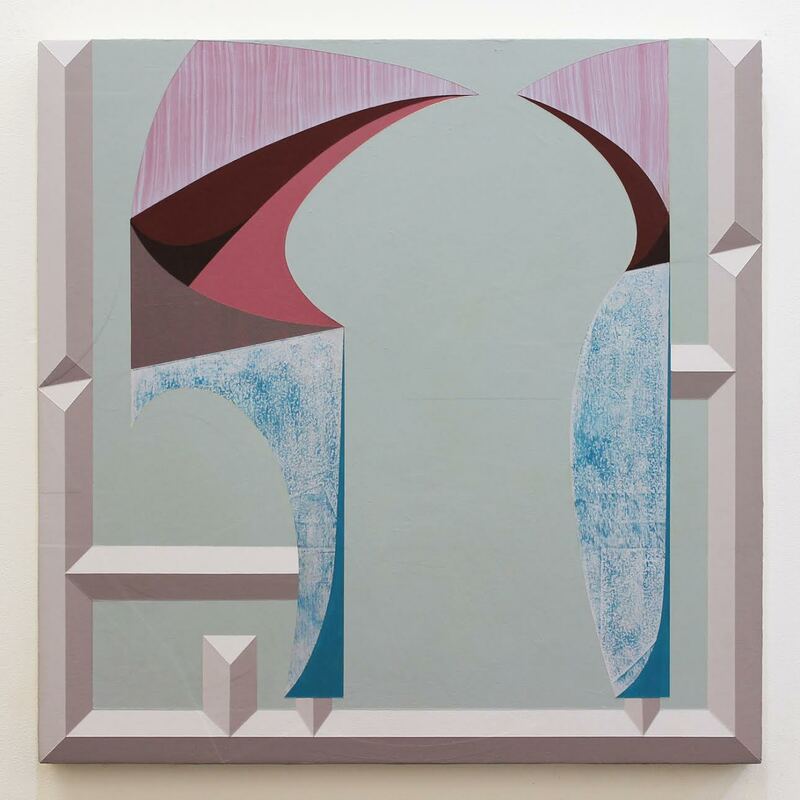 Ben Cove, Amulet, acrylic on panel, 40 x 40 cm, 2015. Courtesy the artist. The paintings also refer to kitsch? You have spoken to me in very interesting ways about taste, and I think that this is what gives me an uneasy feeling when I look at your work. It’s not tasteful, and I enjoy that, it’s what gives your painting a critical edge. Some kitsch stuff I really like for its stupidity. I quite like dumbness in things, things that are stupid and not trying to make claims about being something. It would be very easy to make very kitsch paintings. It would be very easy to make very tasteful paintings. I am bringing those two things together. You can make tasteful things fairly easily, people quite like that, and it’s too comfortable. The work has to have a slightly uncomfortable edge. Painters like Peter Halley are almost anti-modernist because modernism was a lot about taste, and people’s approach to it now is that it is very fashionable. I don’t want to make work that is comfortable. I constantly put things in the work which I’m not very keen on. Your recent paintings are intriguing because their ambiguity suggests spaces for psychic projection, the way you muddle and obscure sources and references, for instance. If you look at modernist painting it’s all very singular and people were very clear about what they would do. I feel that in the twenty-first century you have no idea where you stand. Because its so complicated and you have so much information available. We are so aware that so much is open to the projections of others, the assumptions of others. We don’t occupy singular, homogeneous little worlds. You don’t have a singular opinion about lots of things. You see various sides of the argument. The paintings give you a sense of depth or place but it’s not very coherent. I don’t feel like it can be coherent or cohesive. It’s very hard to be singular about anything. The work is an accumulation of lots of things and I don’t have a singular position. 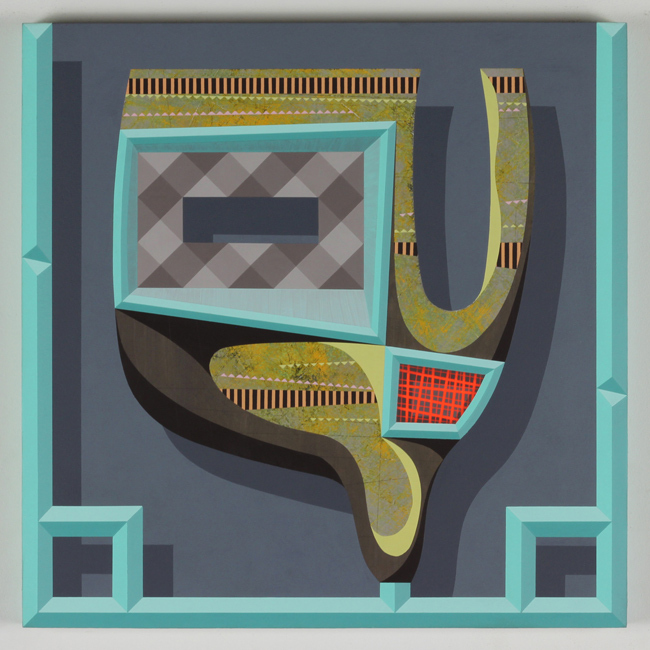 Ben Cove, Freeloader, acrylic on panel, 40 x 40 cm, 2014. Courtesy the artist. Conversation (Ben Cove and Yvette Greslé) London, 30 March 2015. 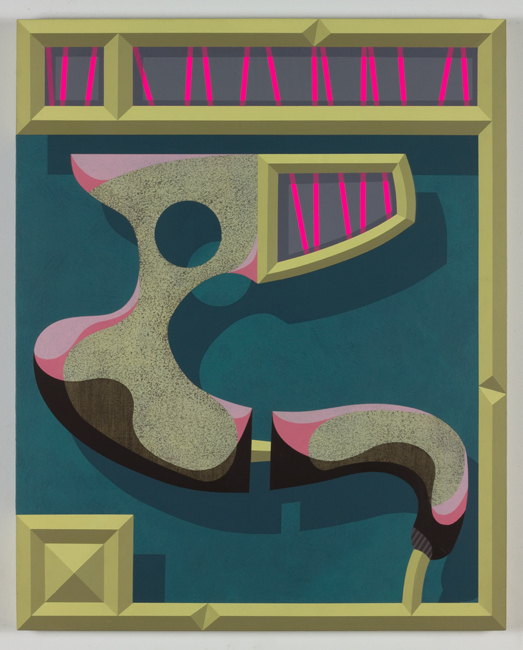 Ben Cove is currently exhibiting at dalla Rosa Gallery and Airspace Gallery. This entry was posted in Interview and tagged Architecture, Ben Cove, London, Modernism, Painting, Sculpture. Bookmark the permalink.